Soda Jerks is a typical diner that offers mainly burgers and soda (made by a soda jerk). So it's quite ironic that I had neither a burger nor a soda... 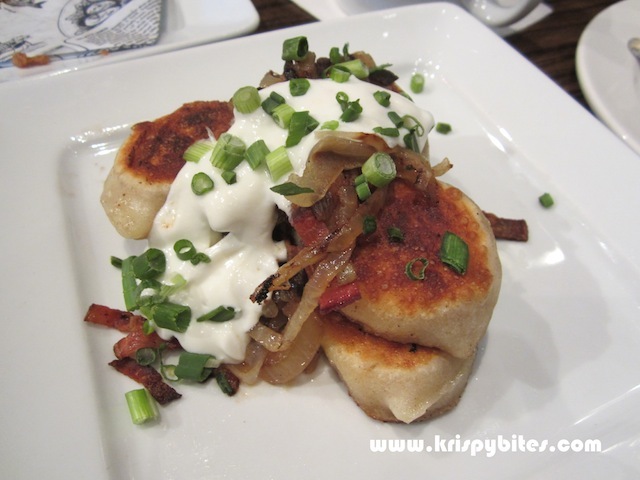 Instead I ordered perogies ($9) topped with sauteed onions, bacon bits, sour cream and a generous sprinkle of green onions. The perogy skin was overcooked and the burnt side was a bit hard. In general these little dumplings were alright, but nothing to write home about. 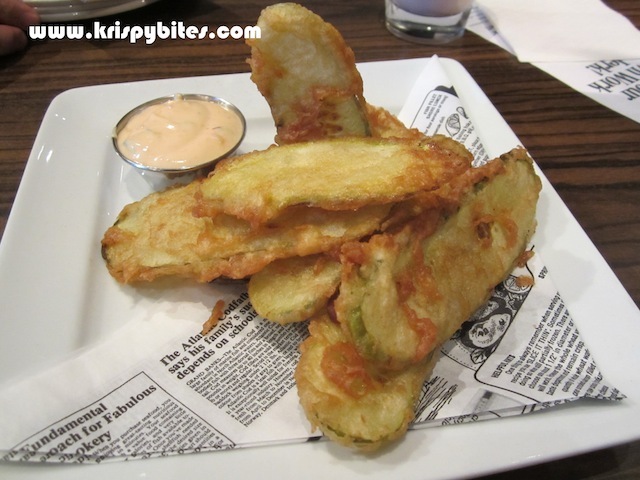 I noticed the Foursquare logo on the menu and the small font beside it stated that a half-order of fried dill pickles would be complimentary for customers who check in to the app. The dish normally costs around $4, so this is a pretty nice perk. I usually take out the pickle when I eat burgers, so I didn't think I would enjoy these, but surprisingly they were quite tasty with a thin layer of crispy batter and creamy chipotle mayo. I probably should have ordered a burger and soda for the sake of the experience, but those are two things that I'm really not very interested in. I just came here for lunch because someone suggested the place and we were in the area on business. Personally I wouldn't come back because I don't like the type of food served, but the place seems quite popular and the burgers look pretty good. Bun and patty lovers should give it a go.